Crieff is one of the series of small market towns sitting on the southern edge of the Scottish Highlands, now popular for holidays and short breaks. The landscape along the Highland Boundary Fault is lumpy and bumpy, sometimes craggy, resulting in lots of hiking routes to small hilltops providing great views. Other walks take in the glens where fast rivers have cut deep gorges and waterfalls. And to the north of all these towns, there are more challenging hikes along mountain trails to higher summits. Crieff is also fortunate to have one of the most attractive and accessible lochs - Loch Earn - close by to the west along Strathearn. This extends into the Highlands proper, with the twin munros of Ben Vorlich and Stuic a Chroin rising steeply to the south. These two peaks are amongst the most prominent when seen from the central lowlands - I can see them clearly now as I type this, looking out from the Dundee to Glasgow train, and the view is the same from the main A9 road. Ben Vorlich appears pointed like an Alpine peak, whilst Stuic a Chroin resembles a lumpy saddle to the left. Closer to Crieff, at the head of Glen Turret, is the more rounded munro of Ben Chonzie (931m) (pronounced Ben y Hone). It's known as one of the least inspiring of all Scotland's munros, but the full circuit of Glen Turret makes a more satisfying day out. The local council (Perth & Kinross) has over many years supported the development and promotion of walks in and around Crieff and the attractive village of Comrie, a few miles to the west, so that there is a good selection of routes to cater for different abilities. This means that even if the hilltops are deep in snow or shrouded in cloud, you can find a lower level walk to enjoy. Calling in at the Tourist Information Centre in Crieff, I was faced with an impressive selection of walking leaflets and books, with the Crieff Walks leaflet providing descriptions of 8 easy routes around the town. These are from 30 minutes to 2.5 hours, apart from one longer 4-5 hour route, taking in woodland, fields and riverbanks. These have been put together from several visits. If you have walked in this area, we would welcome your stories, photos and comments! Crieff is easily accessible by road, less than an hour's drive from the cities of Glasgow, Stirling, Edinburgh and Dundee, making it a popular destination for day trips and weekend breaks all year round. It's just about 15 miles (24 km) west of Perth on the A85, a route often used by tourists heading along the southern edge of the Scottish Highlands. The Crieff Hydro, a long-established resort and conference hotel, has prospered from this accessibility, and has benefited from a major programme of investment over the past decade. We enjoyed a weekend break there in the winter, and then a long weekend in the summer with the extended family to celebrate two birthdays. It was ideal on both occasions. There are many smaller hotels as well as guest houses, self-catering cottages and caravan parks. Close to the town is the Glenturret Distillery, and there are craft workshops, castles, parks and gardens to visit in the area, together with some intriguing shops. 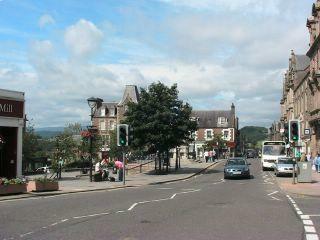 Comrie is about 6 (10km) miles west of Crieff, and it's a similar distance to St Fillans at the eastern end of Loch Earn. This picturesque loch lies within Loch Lomond and the Trossachs National Park, and is itself just over 6 miles long. The A85 road connects these, and runs on along the north side of Loch Earn to Lochearnhead, where it meets the A84 running up from Callander. A quieter and narrower road runs along the south side of the loch, giving access to the usual route up Ben Vorlich. 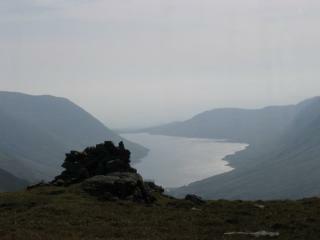 Loch Earn is popular for a range of watersports and there's a caravan park at the St Fillans end.